Christal Padgett is one of those whose life has been changed by the manufacturing certification class offered through McDowell Technical Community College. After completing this six-week class, Padgett was able to find a job at Metal Industries that she could do and it was a job she had really wanted. Jennifer Jolly, 31, is another one of those graduates who found new employment. She was in the second class of this program in 2015. She had worked in a clothing store but was laid off. She tried to go back to school but couldn’t afford the cost. Like Padgett, she had two children and did not have manufacturing skills. 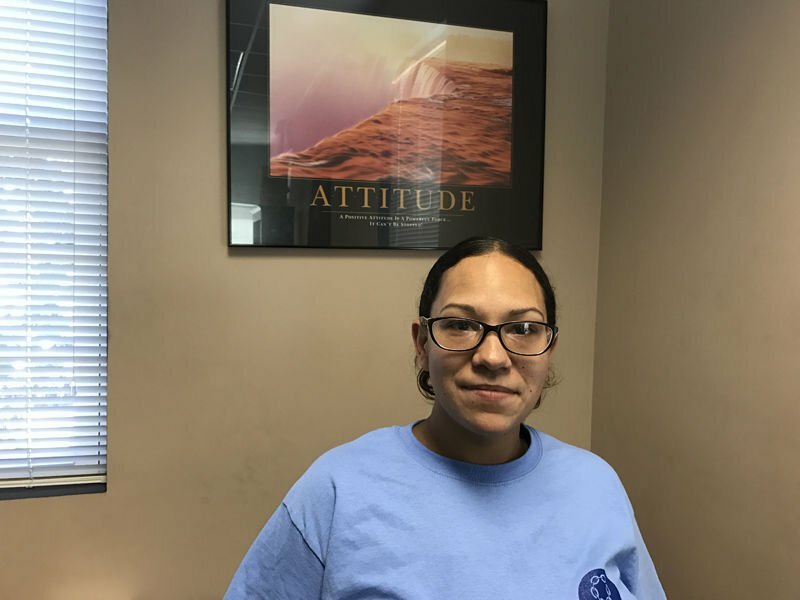 A day after completing this class, she was hired by the Coats America plant, where she is a spinning and twisting operator. Christal Padgett is one of those in McDowell whose life has been changed because of a class. A single mother of three children, Padgett worked at a scrap metal yard until she fell and broke her foot. She told The McDowell News she wasn’t able to work and couldn’t return to her old job because of this injury. As she was filing for unemployment, Padgett learned about a manufacturing certification class offered through McDowell Technical Community College. After completing this six-week class, Padgett was able to find a job at Metal Industries that she could do and it was a job she had really wanted. There, Padgett, 47, now glues insulation into heating and air conditioning units. “I love my job,” she says. This manufacturing certification class did more than help her find this job. But this class, which helps unemployed people in McDowell County find work at our local manufacturing plants, is in jeopardy now due to the loss of funding. It may continue but the cost may be out of reach for those who don’t have a job. They are the ones who need it the most. For two years, McDowell Tech has offered this class in manufacturing certification, which is based out of the N.C. Works Career Center on Baldwin Avenue. The class is held at the Career Center from 8:30 a.m. to 3 p.m. each weekday. Those who successfully complete this six-week class are able to make connections with local manufacturers and earn safety certification with the federal Occupational Safety and Health Administration (OSHA). They can also earn certification in first-aid/CPR, career readiness and Microsoft Digital literacy and gaining an introduction to advanced manufacturing skills. Plant tours, job interviews, on-the-job training and apprenticeships are also available through this class. The class focuses on helping participants boost their attitude, initiative and attendance, said particpants. And this class is offered free for the unemployed, like Padgett, or those who meet income eligibility requirements. Mary Ledbetter, the director of the class and an instructor, said the program has expired the two-year federal grant called Jobs Driven Initiative. This grant helped pay a part-time instructor’s salary as well as the qualified student’s certification fees, which came to $119. Due to the expiration of the grant, the part-time instructor’s position will be gone. The national certifications, such as those for CPR and OSHA, also have a major expense and they won’t be available for free. Ledbetter said she and others with the program want to keep it going and also make sure it is still at no cost for those who can’t afford the tuition. It is also turning out more qualified and motivated people to work at local manufacturing plants. “It’s raising the standards of manufacturing,” said Ledbetter. She and others are looking at ways to find more funding for the class. Overall, the manufacturing certification class has a success rate of 78 percent. Ledbetter said that means that out of 154 graduates, 120 of them have gotten a job. “This is quite an accomplishment considering some of the employment barriers we face - skill levels, criminal records, etc.,” she added. Ledbetter said she will meet with the McDowell Employer Pipeline Committee (which was started by Jerry Broome with Region C Workforce Development) and other officials about coming up with a way to keep it going and keep at no cost. The hope is to not only continue it but expand it into other fields such as medical and construction. “As far as the program as a whole, it has made a difference in a number of the graduates’ lives,” said Broome to The McDowell News. “Our hope is to expand the class and keep making it better. They have applied some of these principles not only to their work life but their personal life and they have seen a difference. He added this program is “not always batting a 1,000” but it is making a difference. “We have some shining examples that we feel makes it worth it,” said Broome. The next class will begin Monday, Oct. 24 and run through Dec. 8, Monday through Friday, for six weeks. For more information or to register, call NC Works Career Center (formerly JobLink Career Center) at 828-659-6001, ext. 140, or ext. 101 for the front desk.